Kmart has a sale that is similar to clearance. 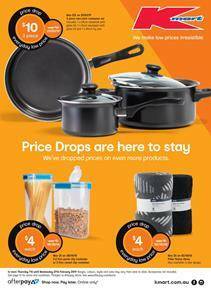 Find storage products, home appliances, kitchenware, toys, exercising products, clothing, underwear, and more categories on Kmart Catalogue price drop sale. The deals are effective until 27 February. You can find several discounts on kitchen products and food storage on the first page. 3 piece non-stick cookware set will cost $10 with the discount. Go to pg 2-3 for a nice combination of deals on products from different categories. These are highlighted items at cheaper prices. Women's classic jean is a great product priced at $6.50! You can find jeans for the whole family on pg 2. Large container, acacia chopping board, square baskets and sheet sets with similar price drops can be found on pg 3. Discover new home products with new discounts on Kmart Catalogue 7 - 27 Feb. Visit pg 4-5 to see home products like vacuum cleaners. One of the best deals is a 2000W multi-cyclonic bagless vacuum that will cost only $47! Also, shop for indoor gym products like yoga mats, therapy roller and more. The catalogue is here for you to browse whenever you need. Also, follow our Facebook page for instant notifications for the posts updated here.